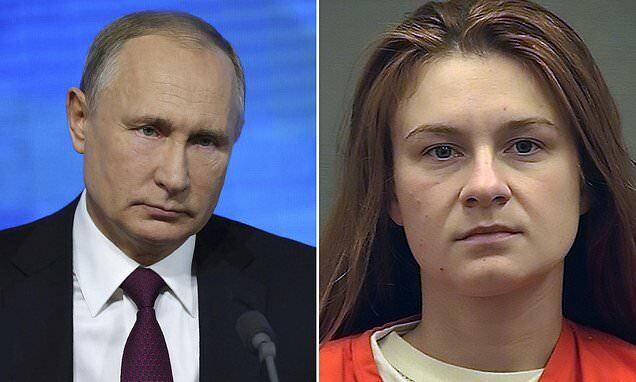 Russian President Vladimir Putin claimed accused spy Maria Butina was not working for his government and said she pleaded guilty because she faced years in jail. 'I don't understand what she could confess to since she was not carrying out any government assignments,' Putin said at his end-of-the-year press conference. Butina pleaded guilty last Thursday to joining a conspiracy on behalf of the Kremlin to cultivate sources inside the Republican party before the 2016 presidential election. The 30-year-old pleaded guilty to one count of 'conspiracy against the United States' when she appeared at federal court in Washington D.C.
Putin has long denied Moscow meddled in the presidential campaign. U.S. intelligence agencies found Russia interfered. 'The Russian state has never interfered and is not going to interfere into internal American affairs, including election process,' Putin said in the now-infamous July press conference in Helsinki with President Donald Trump, who backed his assertion. 'President Putin was extremely strong and powerful in his denial today,' the president said at the time. He later walked back those remarks. Butina said she acted at 'the direction' of a Russian official, who was not named in court, but previously has been identified as Alexander Torshin, a Russian politician close to Vladimir Putin and who is now subject to U.S. sanctions as well as being an alleged mafia money-launderer.